De Legione Romana is an open space, created for deepening the own knowledges and to actively participate. The immediateness of the publication doesn't allow preventive filters, so utility depends from your collaboration and from the good sense. 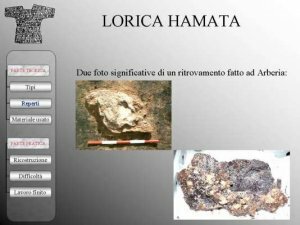 In summer 2002 I have participated as a speaker in the 4th International Congress of Experimental Archaeology: "LET'S REDISCOVER THE LIFE OF ANCIENT ROMAN", developed during the usual Roman village festival. It follows a summary description of the experience and the introduced relationship. Every year in Villadose is hold a Roman festival, called Market of Roman Century, that involves and dignifies this calm and little city. To valorize the cultural value of the festival they are held usually one or two congress: the most important is the Congress of Experimental Archaeology. 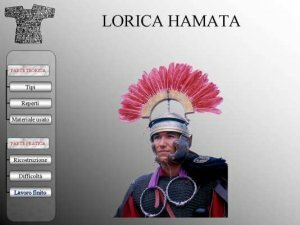 Usually the speakers are prestigious personality that introduce relationships on the technologies and the life of the ancient Romans and the whole first part of the conference is devoted to the art of the fight with relationships on army, cavalry and gladiatura. Reconstruction of Roman legionary cuirasses and armours. 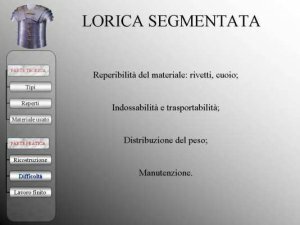 Description of a reproduction of a "lorica segmentata" and a "lorica hamata"
I have also accepted gladly because it was a matter that I knew and I wanted to deepen. 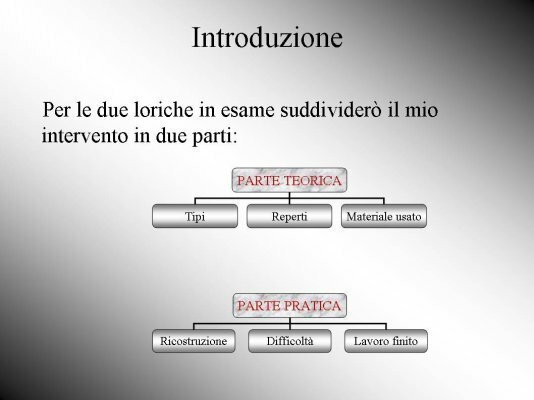 For the preparation and layout of the relationship I have used part of the guides that I had realized for the group, anymore the acquired experience "on the field" from the GAV member Sandro Maragno, that had reconstructed, with the help of 2 blacksmiths Luciano Pavanello and Gigi De Agostini, 6 loricae segmentatae for I Italica group and 1 lorica hamata for personal fun. 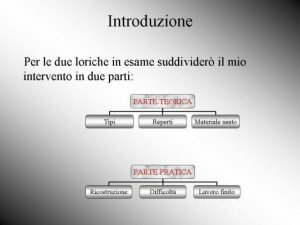 So, I have been able to connect the theoretical part to the practice one and to produce a brief but complete relationship. Unfortunately Sandro Maragno has not been able to participate in the congress and therefore I have managed alone the intervention. I propose the original static slides projected in the congress, anymore the notes that I had written as slides comments. Thank you for being present in this presentation. 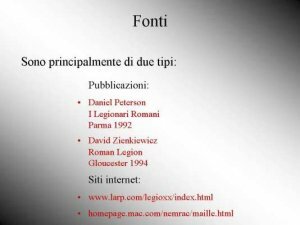 My name is Nicola Rainiero, vexillifer of the I Italica group. I am here for illustrating you as we have reconstructed the loricae Segmentatae and Hamatae. 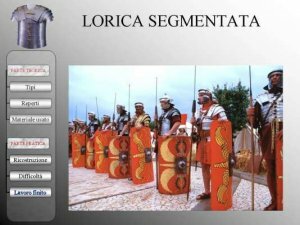 Sandro Maragno is a GAV member, he has founded the I Italica group and has personally followed the realization of these two types of armor. 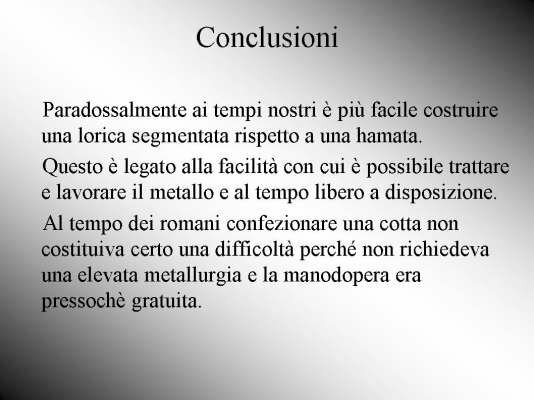 the MATERIAL-USED for the reconstruction: the reasons. 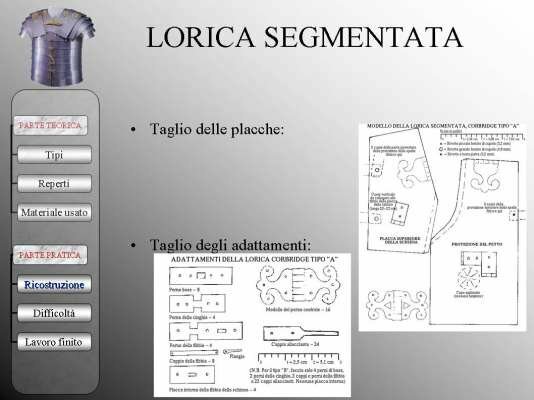 the LAST RESULT, a simple photo of the lorica in examination with description of the gotten product. Thanks to these two books we have started to realize the first armors. The experience of reenactment groups in the web has allowed us to resolve some constructive problems. 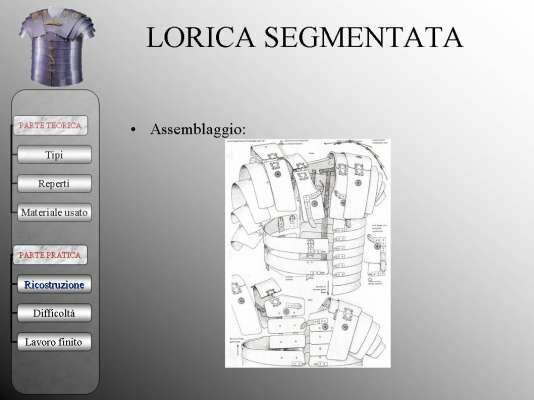 I will start from the Lorica Segmentata because it was the first armor that we have studied and reconstructed. 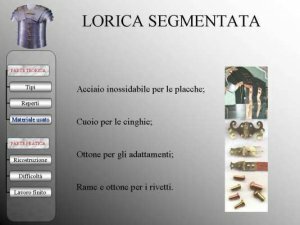 "Lorica" is a Latin term that means leather strips; "segmentata" is a modern term applied to Roman classical iron caresses made of plates, introduced at the end of the first century B. C.
However its origins are unknown. 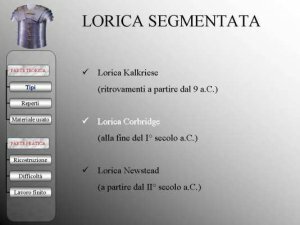 Recent discoveries done in the Teutoberg Forest and in other places have shown that the lorica Corbridge that we and the most greater part of the Roman groups uses it was not the first type of Lorica Segmentata used. However it is the only type, that currently for quantity of recoveries and done studies it can be reproduced with extreme accuracy and besides for dating it draws near to the date of the foundation of our legion. 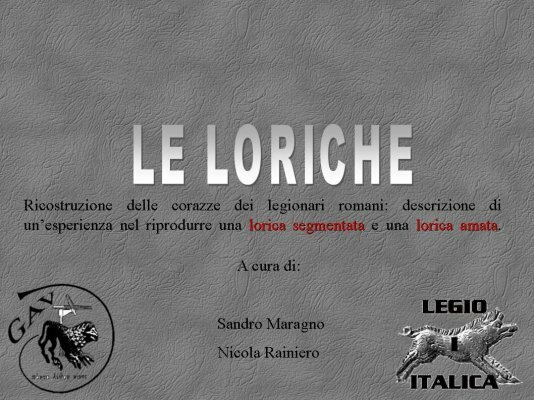 What differentiates these three types of loricae? It is the form of the plates, of the adaptations and the type of edging. In this slide I have brought two examples of remains that they are usually found in the archaeological sites. Stainless steel slabs, thickness around 1 mm (callipers 18) for the plates (40), if we stuck to realities, we had to use some mild steel to be more authentic but this would have involved the presence of the Rust with all the connected problems. Natural leather (2 mm tick) for the straps. 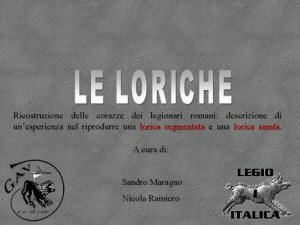 Unfortunately the first loricae don't have the leather but strips of synthetic material. Brass plates of varying thickness (0,5-0,8 mm) for to stamp the adaptations. Copper and brass for the rivets. The rivets are of three types: flat head (130), small (160) and great (24) furnished of dome. They serve for fixing the plates to the straps and the plates to the adaptations. To reconstruct a lorica segmentata has a problem: the sizing of the plates, better to attribute a correct proportion to the metal strips that then they will be fixed the one to the other. To do this we are based on an initial standard model that we after have improved according to the physical demands of the soldier to which it was destined. 2) assemblage: folding and rivetting the parts previously cut. To do this we have departed from the shoulder plates and we have connected the others. 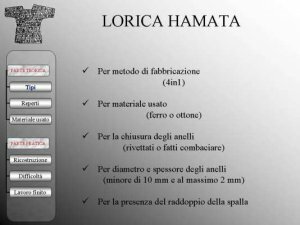 The availability of the material, for example rivets and the leather strips. 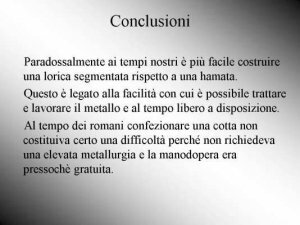 Presence in phase of construction and when it breaks itself of an experienced blacksmith. Wearability: the weight and the conformation of this lorica need a help to wear it.The weight extends to accumulate on the shoulders that are in effects the point of support of the whole lorica. The constant maintenance that means to oil the leather straps and to polish the plates and the external adaptations. The photo shows 2 different groups both provided with lorica segmentata. Our soldiers have a greater shield and they wear a 8 kg weight lorica. Currently we have built 10. The first 6 have some imperfection (plate cuff, synthetic straps, little coordination) the last 4 instead have been made to measure and they don't have these problems. The Lorica Hamata was the standard armor before the introduction of the segmentata and remained in use among the legionaries for the whole imperial period. This iron sweater was also brought by musicians, carriers of insignias and clearly from the auxiliary troops. That this why they exist in a lot of types and it is not possible to give an exact characterization of it. 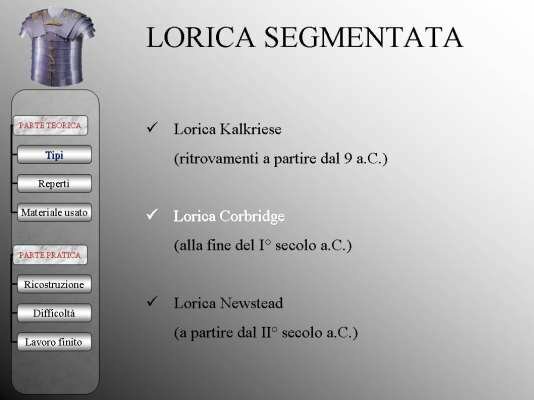 In the slide I have put in evidence the more important distinctive characteristics. 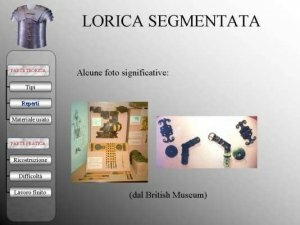 In this slide I have inserted an exceptional find: a lorica hamta complete found in Britannia. A spool of around 35 m of thread galvanized, 2 mm thickness (callipers 12). Leather to dress the doubling of the shoulder. Steel 1,5 mm thickness (callipers 14) for the adaptations (the hook that it is seen in photo). 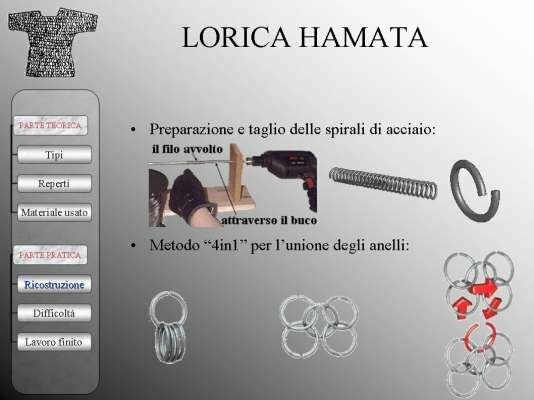 1) It builds a tool to yeld steel spirals and they are cut stopping them on a vice. We have also produced them with the help of the blacksmith, using a lathe and this has made them more uniforms. The final result is an open ring. 2) We have used the method 4 rings in 1 to build the base unities. With these we have produced the strips that have constituted the stitch. The rings are from time to time closed (that is to fit the two extremities) with the aid of a normal tweezers. 3) Assembly: it is necessary to pay attention how the rings lines stick , because a wrong orientation involves a wrong expansion of the rings, and so the whole sweater. The scheme shown in the slide has allowed us to observe the correct orientation of the rings in the single parts of the maille, but for the sizing of the single pieces we have tried from time to time. 4) Galvanization removal: this confers to the lorica a more authentic aspect. The time to manufacture it: to unite thousand and thousand of rings requires a constant and prolonged work;The wereability: the weight obstructs the wearing how if it were a normal shirt, even if once worn this is uniformly distributed on the whole body. The maintenance: it needs to avoid that rusts itself, requires a continue prevention job: greasing and cleaning. 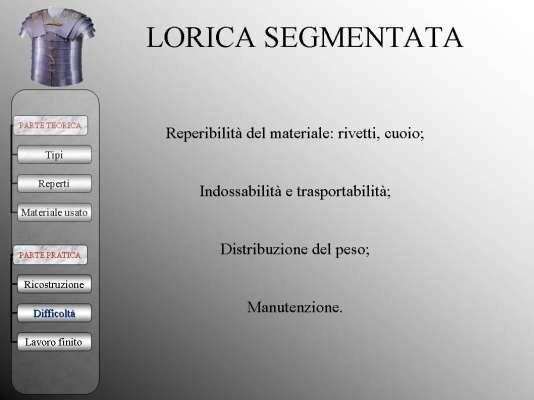 The photo shows our centurio that wears a 14 Kg weight lorica without the doubling of shoulder, it is worn thanks to an opening on the back. 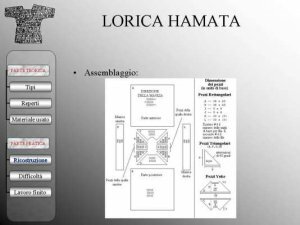 We have built currently 2 hamatae or better two legionaries have built them ring after ring. 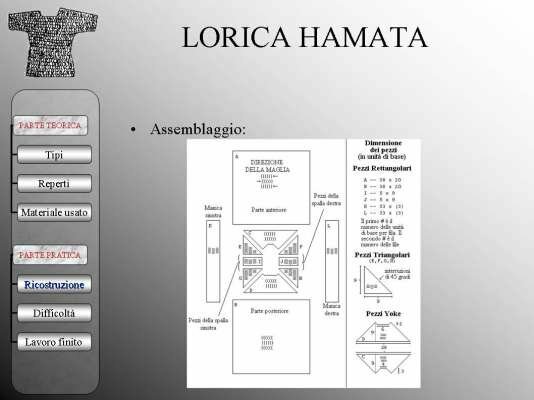 Paradoxically today it is easier to build a lorica segmentata rather than an hamata. Because it is easier to treat and to work the metal and it is had less time to disposition. 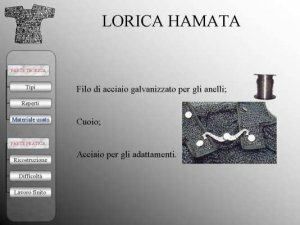 In the Roman age to manufacture a lorica hamata didn't constitute certain a difficulty because it didn't require an elevated metallurgy and the manpower it was nearly free. Experimental archaeology aims to reconstruct, reproduce and experiment several aspects of the lives of the Ancients. During the Conference the subiect will be widely discussed in order to improve our knowledge of their lives. Either experimental topics or other subjects recalling the past will be discussed such as the reenactment with all its educational aspects, museums, archaelogical sites, the persistence and the influence of ancient techniques and customs on present everyday life. 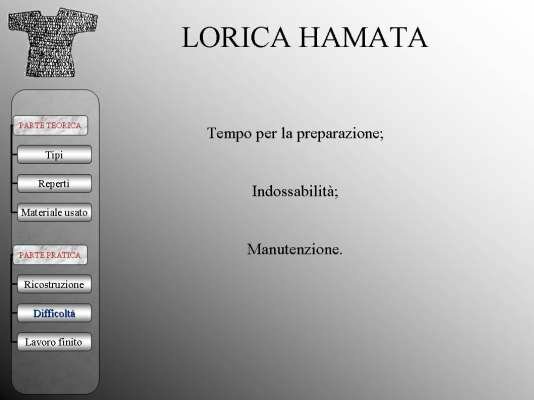 Ore 10.00 a.m.: Welcome of Authorities and beginnings of works. Chairwoman dr. Anna Maria Liberati - Director of Museo della Civiltà Romana di Roma. 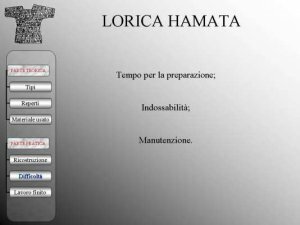 Experience of telling the time on a reconstructed hemiciclum "sun-dial"
Research and experiments of agriculture of Gallo Roman peoples. Lunch at the "Taberna del Legionario": 15 euro. 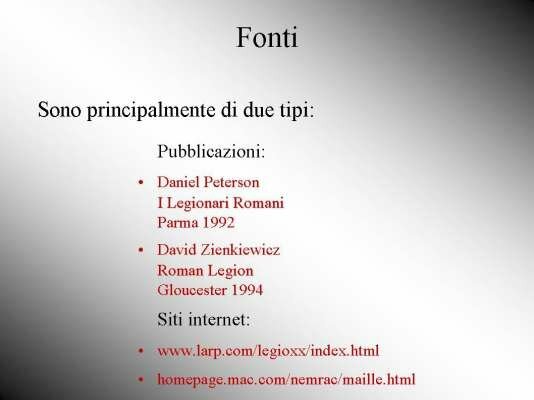 De Legione Romana is an open space, edited by Nicola Rainiero. Powered by Drupal and based on a rielaboration of Bartik Theme.